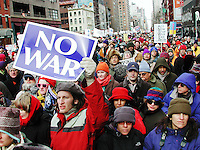 Upon the passing of the Iraq War Resolution in late 2002 by the United States Congress, a movement was born under the simple banner of "Anti-War". While most supported the United States in its fight against terrorism, it was thought (correctly as it turned out) that declaring war on Iraq was both false in its premise and dangerous in its precedent. The adherents of the movement hailed from all corners of the globe but some of its most outspoken members were those that hailed from New York City, whose citizens were already weary of being used as political chess pieces, whose very real pain and loss from the tragedy of September 11th they felt was being exploited for various unrelated agendas. Although the coordination and scope of the protests was unprecedented in the years following the declaration of war, the response of the US government was underwhelming and ultimately demoralizing to the movement. Mass protests attracted fewer and fewer people as many felt that their voices were indeed being heard but ultimately ignored.